Mortgage refinancing is a renegotiation of the terms of your loan. Many people use it to get a lower interest rate, or to reduce their monthly payments by lengthening the termYou can reduce your monthly payment through either mortgage refinancing or mortgage modification. A mortgage refinancing allows you to take out extra cash, consolidate you debt, and avoid foreclosure. With interest rates at an all time low, there has never been a better time to refinance your mortgage. Take advantage of these interest rates and save thousands of dollars over the term of your loan. Mortgage refinancing is an easy and effective way to save thousands of dollars on your loan. In addition to lowering your monthly mortgage payments, it can allow you to borrow cash against the value of your home, among other things. Switching from an adjustable rate mortgage to a fixed rate mortgage – If you locked into a high interest rate before the recession, then you don’t necessarily have to keep that rate forever. During the refinancing period, you can change your mortgage to take advantage of today’s record-low interest rates. Borrow cash against the value of your home – One of the most popular things to do during your refinancing period is to take out extra cash. This capital can be used for home improvements, business investments, or anything else. It’s your cash. Consolidate your debt into one package – Many people have credit card debt or auto loans in addition to their mortgage. If you want to save money on all of these debts, you can bundle them together through mortgage refinancing. This can be particularly useful if you want to reduce high-interest credit card debt. Create a more manageable payment schedule – As mentioned above, many people use mortgage refinancing to manage their monthly loan payments. If you are struggling with a crippling level of debt, refinancing your mortgage can be the difference between keeping your house and being evicted from it. Furthermore, if you are struggling with your mortgage payments, the American government may be willing to expedite the refinancing process for you, which has helped families across the country continue to live in their homes. Typically, mortgage refinancing can be completed within 30 to 60 days, after which your monthly payments will reflect the changes you have made. Usually, the refinancing agency will require a home appraisal before they proceed, as well as verification of your income. With interest rates at a record low today, there has never been a better time to refinance your mortgage. By refinancing your loan, you can reap the benefits of home ownership, and save thousands of dollars in the process. About 50 percent of the people who get mortgage loans to purchase their homes refinance them one or more times. 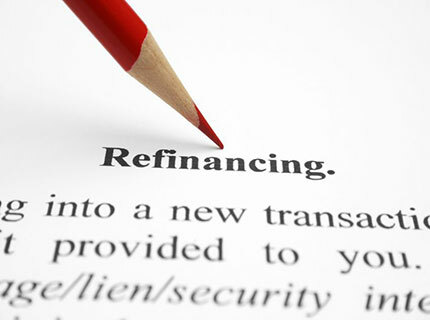 Many people refinance specifically to change the terms of their loans. Get Mortgage Loan Refinance information delivered directly to your inbox.